With a slogan like “the best yam vodka on Earth,” Covington gets out of my gate with a head start. If you are not a pun enthusiast, that may translate to a 10-second penalty. It’s made in North Carolina and thus qualifies as a local spirit for me, one that attracted my attention as soon as word of it hit the social media scene. So I was excited when a foodie friend gave me a sample bottle to taste for the blog. And yes, that is my disclaimer that my alcohol was provided for free for this post. You are such smart readers! Vodka is a spirit I drank plenty of when I started out in the brave new world of libations, but I haven’t had it often since my tastes grew more … refined, shall we say? Naw, that’d be a lie. I just moved away from vodka-based fruity cocktails and toward the stronger stuff. So I’ve only tasted one or two vodkas for the blog before. I chilled the bottle in the freezer, as the online hive advised me, then poured it into my triple shot glass. Yes, this is an excuse to show off my triple shot glass. The coloration is uniformly clear. Its smell is mild and pleasant, nearing toward marshmallow with an earthiness that grounds it. The vodka has much more flavor as I drink it than I expected. That marshmallow impression remains, but that may be because yams make me think of sweet potato casseroles with marshmallow toppings. The alcohol burn is mild. The potatoes add a natural, gentle sweetness that pleases me. As it moves toward room temperature (yes, I’m a slow drinker), the alcohol gets bolder and spice comes out, but not the pie type. They are close to fenugreek or coriander. I’m intrigued by the broadening flavors, but I do think the vodka is better chilled. Covington Sweet Potato Vodka is quite pleasant, almost like Pinnacle’s whipped cream vodka but so much less artificial in flavor and sweetness. It would make a great martini, but nothing dirty or cheesy would combine well. Perhaps a vermouth wash would work, but I’m hesitant to suggest that either. More creative thinking is needed. 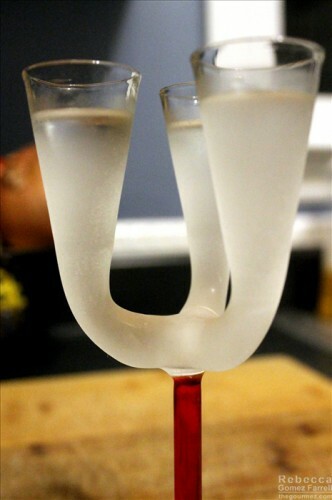 Maybe Lillet Blanc as a wash? You don’t want to obscure the subtle sweetness of the yams. Alas, I had only enough vodka to fill that glass, so I’m only dreaming of the possibilities. I didn’t find anything by way of blogger reviews. 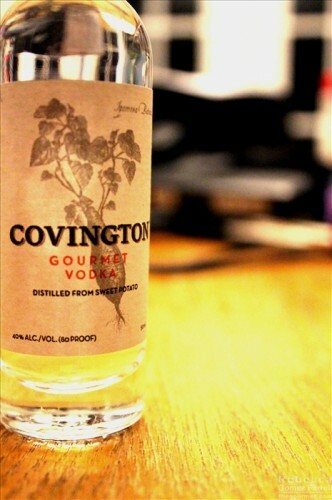 But Covington did win a 2013 Gold Medal at the San Francisco World Spirits competition, so congratulations to them on that! Made a black olive dirty martini with this the other day. Stuffed some Gorgonzola into the olives. The black olive brine brought out more of the smokiness on the back end. That sounds like an intriguing new layer to the flavor of this vodka. I may have to experiment with it! It might take a while to build up to national distribution. I think it’s only sold in the Carolinas for now. But their representatives at their website would know best!